What did we learn from Malaysia? Well, we learned that Bernie Ecclestone, just like King Canute, cannot control the world’s tides, times and weather. We also learned that in the monsoon season in Malaysia it rains late every afternoon, and we learned that it gets dark around 6.30 p.m. We also learned that the “I” in the FIA stands for “Indecision” or perhaps just “Inept”. What had looked like being a good event, eventually became a farce. Bernie Ecclestone and his lap dog Charlie Whiting are totally to blame for making F1 a laughing stock. In his desperation to allow the European viewers an extra hour in bed on the Sunday mornings with the delayed starting times from Australia and Malaysia, this runs the race into darkness, and at last count no F1 car has headlights. Then the 50 minutes delay while Charlie made up his mind as to whether the race could continue. Of course it couldn’t continue. Blind Freddie could have told you that, Charlie. And if Blind Freddie wasn’t enough, all the drivers said they wanted it stopped, and the drivers are the ones who put on the show, Bernie and Charlie. No, Charlie dithered (at best) and prevaricated (at worst) to keep the television transmission going for the two hours allocated to the Bernie show. To send some lackey down under an FIA umbrella (in more ways than one) to the drivers to say that all drivers from P3 backwards will have to unlap themselves first before the ‘race’ could continue is sheer lunacy. How, pray tell? I am sure it was just coincidence that had Charlie officially stopping the race three minutes before the end of the two hour telecast. A sorry (and soggy) day for Formula 1. My pick for star driver of the evening (I was about to write “day” but changed my mind) was Kimi Raikkonen. Whilst the other sodden drivers were standing muttering ankle deep in water on the main straight, Kimi had parked his car in the pits, gone off and had a shower and changed into clean civvies and was eating a chocolate coated ice cream when the FIA finally stopped the race. Well done, Kimi. However, all credit to (Ross) Brawn GP, in producing a car that can win in the dry and the wet. Button deserves his second win on the trot, despite his woeful start. Barichello is currently a good back-up, but not really challenging Button, unlike last year where he was the better of the two under the Honda banner. Toyota have become a real force to be reckoned with. Trulli and Glock doing very well, though Glock’s third place was through the luck of the tyre draw and where the car was at the end of the 31st lap (red flagging means the cars go back to where they were at the end of the lap before the red flag). Heildfeld (BMW) was even luckier, but Kubica must be wondering at what is going on with the famed German team, with his engine failing on the warm-up lap. He then tried to start, hoping that God would come down and fix his engine. He didn’t. In fact, I doubt very much whether God would even bother watching the Bernie and Charlie show. There’s better endings in Thai soap operas. At least the hero gets the girl. Other drivers who showed the ability to ‘race’ included Webber (Red Bull), Alonso (Renault) and Hamilton (McLaren). Drivers who have no clue how to race included Kovalainen (McLaren), Piquet (Renault) and Nakajima (Williams). The next race is Shanghai on April 19. Let us hope that the FIA listens to the F1 fans by then. Last week I mentioned that the first manufacturer to produce a million cars anywhere was Ford in 1922. I asked what was the first British car to sell over one million units? The answer was the Sir Alec Issigonis’ Morris Minor between 1948-1961. Not the Mini as many of you thought. So to this week. Do you listen to the radio on the way to work? What was the first British car to offer such an option? And when? Last week was mainly a run-down on the cheap Chinese offerings, and they were certainly cheap at under B. 400,000. The interiors were, however, very nasty. I had gone to the show fully expecting to have put a deposit on one, to replace the mighty Mira, but I could not see myself driving the plastic interiors - acres of buff colored plastic. Several of the exhibitors showed a remarkable lack of marketing of their products. Parking a few of your vehicles, like on a parking lot, does nothing to excite the senses and make your cars more desirable. GM had plenty of cars lined up in rows (but nothing new) and the most exciting thing they could do was to dress up a Captiva with shiny wheels and bright crystals around the grille. Perhaps they thought that having presenters with Afro wigs would quicken the senses. They were wrong. Across from GM was Mazda, which had some tarted up Mazda3’s and an MX5 on a stand. 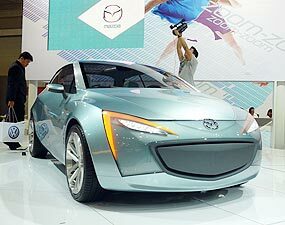 They did also have the Sassou concept car which heralded the styling cues for the Mazda2. They also displayed all the awards they had won, so somebody did think and try to brighten up their stand. However, I have been told that a gentleman went there to order an MX5, but gave up when the sales person had no idea of delivery or color! He then went to the VW stand to ask about the VW Scirocco (featured last week) and the “sales” person could give no information of colors or delivery either. He went to BMW and bought a 3-Series. There is a lesson here for somebody! Mitsubishi had their new Pajero Sport SUV on display, but some imaginative comparisons between their product and the Toyota Fortuner might have got them some more orders. Ford had the new Focus TDCi. 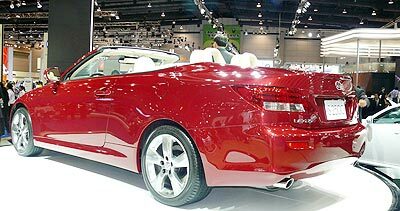 This is a pretty car and with the direct injection diesel engine will be very economical. Other than that, the stand was cluttered up with Ford pick-ups which are about as exciting as a cold porridge sandwich. Report card says: Can do better! Isuzu has a problem. The demand for pick-ups is falling, while the demand for passenger cars increases. But Isuzu only has pick-ups. Painting one in shiny silver isn’t enough to reverse the trend. Price cutting would! Toyota had many cars on display, including the ‘all-new’ Yaris - with the all-new front bumper and grille. They had a stand full of ‘information’ girls who thought that their reason for being was to smile and give pretty V signs for photographers. It may generate photo traffic, but it doesn’t sell cars, sorry Toyota-San. While on the ‘all new’, Nissan had the ‘all new’ Teana, which looks exactly like the old one, other than around the headlights. I think they did the right thing by hiding it between their other vehicles. 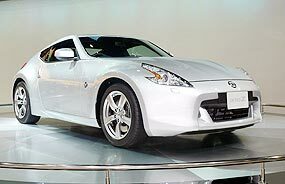 Of interest was the Nissan 370 Z, well displayed on a revolving plinth. Looks great from all angles. It would have been nice to have a GTR on display, but no joy, though there was one down in the accessories area. The other noteworthy item at Nissan was the Frontier pick-ups which were drive away at B. 29,999 and terms on 2.999 percent interest. Honda did show a couple of their race cars, a Civic and a Jazz, but with Honda having pulled out of F1 this may not have been the best time to display corporate motor sport spending. 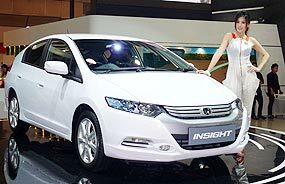 The Insight was nicely presented, but with no firm pricing and the interest in fuel misers waning, it did not generate much interest from Joe Public. The new Accord looked stunning in white, and it is easy to see why they have been selling well. Mercedes-Benz had the premier launch of the new RHD version of the E-Class coupe. A very nice looking motor car, but the price tag of nearly 8 million baht for the AMG version on the stand will frighten away most people. The CLC sports coupe at half the price looks very good in comparison. The new generation B-Class 180 Cdi sports tourer at 2.8 million also deserves more than a passing look. BMW I mentioned last week, and their stand was so predictable, it looked as if the same cars were sitting on the same spots as last year. 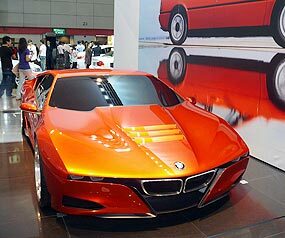 The M1 Hommage was a huge disappointment. It was a huge whale of a car which did not excite, and incidentally hidden at the back of the stand. BMW would have done better to bring it to the front where they had the Z4. It is a more eye-catching vehicle than the Z, with its size if nothing else. Lexus was there, and quite frankly, Lexus has lost the plot. The big LS 460L looks exactly like a BMW Bangle 7-Series side on. The open iS250 coupe has a huge backside on it, complete with another Bangle bustle. Here we have BMW toning the unloved rump down, and Lexus adopting it. Lexus was a leader for a short time with the iS250, but no longer. Yontrakit Corporation displayed Naza, Kia, Citroen and Audi, but were in one of the subsidiary tents, sharing space with motorcycles, boats and a handful of vintage cars. The traffic past their stand would have been much more if they had secured space in the main exhibition hall. The Audi Q5 is quite a motor car, and at 3.49 million baht should be considered by anyone interested in the luxury SUV end of the market.